Post frame buildings are not limited strictly to garages, barns or shops. There are many other types of buildings, PermaBilt® has built in the past 40+ years. One particular Chinook Washington resident, who wanted to build an arts & crafts studio, asked to learn more about t he process. So a Building Representative was assigned to help her with a free in-home consultation at her property. He listened to her needs and got to know her requirements, ideas and site options for her building. Secondly, he worked with her on a design that fit her need s and her budget. 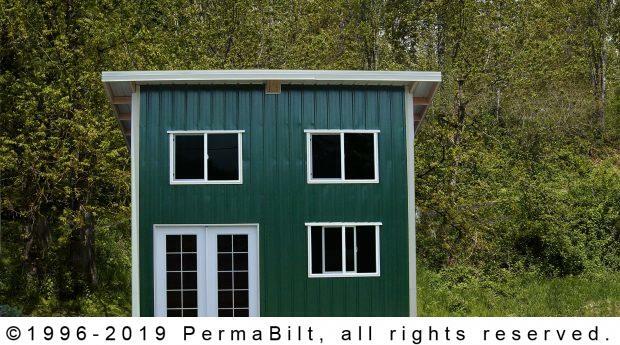 Once financing was discussed and the blueprints finalized by PermaBilt® engineers, the permitting department applied for and obtained all the necessary permits. Then with the permits obtained, site preparation work completed, payment terms met, the construction crew schedules material deliveries. Experienced crew members worked together in managing her building. And like most customers she had plenty of questions which were happily answered by the administrative construction office. Then inspections are scheduled at specific points throughout the building process keeping her building on schedule and guaranteeing maximum quality for her arts & craft studio. And when this beautiful building was complete, she was ready to move in her art supplies and start on her next craft project in her new studio.